Located at 2599 Airport Drive in Torrance in the Rolling Hills Plaza on the corner of PCH & Crenshaw Fish Bonz will be offering Grilled Fish and Seafood, like our unbelievable Grilled Salmon with our succulent garlic butter sauce or our scrumptious Shrimp Tacos so fresh you would think you’re eating right from the docks, all at affordable prices. In order to meet our high standards in freshness, we will only use fresh ingredients brought in daily to insure impeccable quality and taste. Fish Bonz design elements brings a very hip and industrial trendy atmosphere while using natural wood trimming, stainless and brushed aluminum accent in a black and white theme. Located directly in front of the AMC Theaters this fresh and healthy seafood grill will occupy both indoors and out door area, there 2 very large outdoor patios will be covered in sleek black awnings that can be completely enclosed for cooler weather with added patio heaters for upmost comfort year round. The outdoor patio tables will be trimmed in brushed aluminum with black wood slats and matching chairs, while the interior will have details of natural wood, metal accents to give depth and dimensional appeal, custom mahogany bench seating and tables, black leather chairs trimmed with lacquered metal framing, plus modern nautical lighting that says, this is not your ordinary fish house. 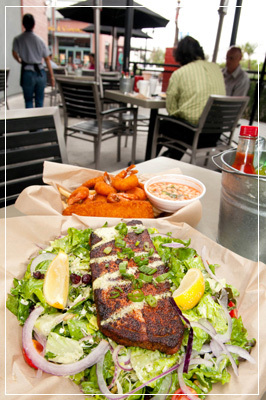 Fish Bonz menu was created for the health conscious individual who does not believe in compromising taste.